Information about Alamosa Skate Park. View Alamosa Skate Park in a larger map. 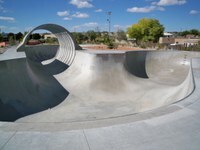 The largest skate park in the southwest is here in Albuquerque. The park is designed for BMX bikes, skateboards and in-line skates.